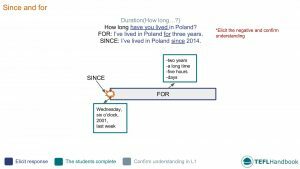 This ESL lesson plan contains activities and games for teaching the present perfect with since and for to elementary level English students (A2). Feel free to use these ideas in your ESL classes. If you're an iOS or Android user, try this lesson out on our TEFL Handbook app. It gives you offline access to all of our materials, perfect for quick reference in the classroom. The board work below shows one way that you can illustrate the use of since and for. Explain to the class that we use for to express duration and since to highlight when a particular event or activity began. 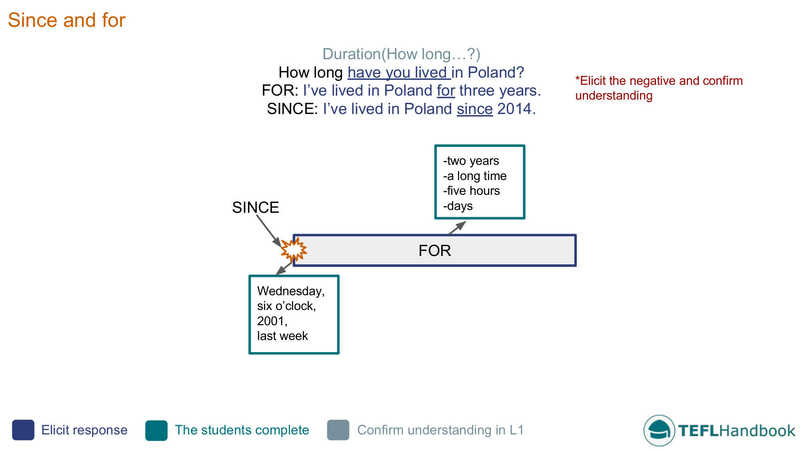 Next, write the sample 'How long' question on the board and elicit example responses using both for and since. Finally, you can use the timeline to expand the concept in terms of the common time expressions that apply to each. 4. _____ a long time. Monitor the students as they interview each other and correct any mistakes. Here is one game that English teachers can use to practice the present perfect with since and for. As usual, our suggestions require the minimum of resources (whiteboard, markers and some students). The aim of this game is to trick the opposing team using present perfect statements. On each turn, a student is randomly given one of the words from the game title and must make a present perfect statement about themselves. It can be true or false. The opposing team should then ask follow-up questions to determine whether it's true or not. Encourage the other side to ask questions by awarding a point for each grammatically correct question. The student in play gets 5 points for a grammatically correct sentence and another 5 for bluffing the other team. Our suggested next lesson on expressing possibility. If you've found these materials useful, be sure to check out our full list of elementary ESL lesson plans, A2 lower and A2 upper. For other levels, have a look at our complete selection of EFL - ESL lesson plans. If you use an iOS or Android device, try out the TEFL Handbook app. An ESL lesson planner for English teachers. It has a lot more content and gives you faster access to our ESL resources, making it easier to use in class.